Television is known for creating the "perfect" boyfriends. The kind of guys who perform grand romantic gestures to get the girl or boy of their dreams. While those types of guys are great for the short-term, they are usually not the type of guy you'd like in real life. Don't worry though because all hope is not lost when it comes to TV boyfriends. In fact, Shadowhunters is a show that has done an excellent job when it comes to creating men who are the perfect "boyfriend material" model. All of the men in the Shadow World are unique and have qualities and features that make them very attractive. However, one vampire stands out above the rest when it comes to being the greatest boyfriend. If you watch Shadowhunters online, you know Jace, Alec, Magnus, and Luke may possess some great qualities, but Simon exemplifies everything a boyfriend should be, all while being his wonderful self. So let's sit back and consider all of the reasons why the scrappy nerd from Brooklyn is the be all, end all of TV boyfriends. Also, make sure to let us know in the comments why you love Simon, or why you think another man from the Shadow World should be considered the epitome of #BoyfriendGoals. One of the worst things about long-term dating is when your significant other gets a little too comfortable and starts eating your food. With Simon as your boyfriend, you won't have to worry about that. He's not only a vampire but a vampire who can go out in the sun (aka a Daylighter). So, he can take you out for breakfast, lunch or dinner, and pleasantly watch you devour your meal as he sips on a cup of O-Negative. As long as you don't accidentally cut yourself with a knife while eating, you should be in for one hell of a romantic evening with a full plate of food just for you! It's safe to say two words when you first get a glimpse of Simon. Hubba hubba! How Clary managed to stay friends with Simon for so long without ever being attracted to him is a supernatural feat because he's a real looker. Whether it's his big brown eyes, his silky dark brown hair or his muscle toned body, he has plenty of physical qualities that make him irresistible. Jace may claim to be the ladies man on Shadowhunters, but it's clear that moniker belongs to Simon. He's dated the most women on this show, and one quick glance at his face and his physique explains it all! Sometimes when two people have been in a romantic relationship for so long, both people start to change. Obviously, both parties are starting to age, and when two people get very comfortable with each other, they might let themselves go. However, neither will be the case with Simon. One of the perks of being a vampire is that you don't have to worry about aging. Simon will always have a youthful glow no matter how long the two of you are together! Simon also can't eat sugar or carbs, and since he's technically "dead" his body will always remain as is. So, you will never have to worry about him losing that six-pack, it will last for eternity! Simon may get himself into a lot of trouble, he's been kidnapped like ten times, but he always learns and grows from these terrible things that happen to him. These unfortunate events have made him wise beyond his years. That's why he's always the guy his friends go to whenever they need a little guidance. The best part about Simon's advice is it never comes off as judgemental. He's always understanding and doesn't blame anyone for their flaws or mistakes. 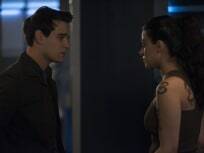 Despite having her brothers at the Institute, Isabelle almost always goes to Simon whenever she needs some advice. He played a small, but crucial role during her yin fen addiction, and made her feel loved and strong throughout her struggle. Unlike most, Simon always makes himself available to his loved ones to talk and more importantly, listen. Shadowhunters Preview: Can Jace Pull Clary Back From the Edge? Clary: Maybe we go straight to the source. Jace: Are you talking about Lilith? Permalink: Straight to the source. Shadowhunters Review: Will True Love Conquer All?